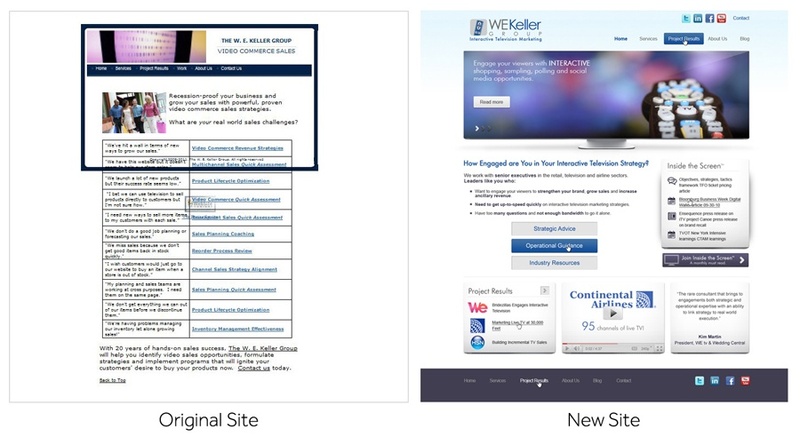 How do you know when it's time to update the look of your site? This is a question many companies ask themselves. You may see other sites that you know look good, but what is it about them that makes them better? Does your site not have a logo? This is probably the most important piece to have for your visual branding. In the before example above, the company only had their name in text on the right side. Most of the time, it is best to put your logo on the left, as that is where the eye is drawn to first. In the redesign, we created a logo that is simple and related to what the company is about. Is your site filled with boxes and tables, or is it more free-flowing? The majority of the before home page is a simple two column table, which does not pull prospective clients in. Instead, the homepage should have condensed text which brings out the basics of what the company is about. Providing buttons that are big instead of links will encourage visitors to learn more on other pages of your site. In the original site, the border that is supposed to go around all of the content of the page doesn't in this screen shot. Also, there is a faint graphic overlapping the table that is probably supposed to be at the bottom of the page. These errors are due to problems with the code or insufficient browser testing. It is important to see how you site looks in a variety of browsers (Firefox, Safari, IE, Chrome) and on both Macs and PCs. Your site may look good to you on your computer, but it may look different on another. If you have your own developer, make sure they do extensive testing before your site goes live. It's unclear what the vibe of the company is in the before website. There are a couple pictures and lots of text, but you need a certain style to the overall site to really show what your company is about. In the new website's redesign, we used elements related to video and media to tie in the theme of the company. The style also shows your company's professionalism on the web, which will increase your number of clients. What is the color scheme of your site? In the original site here, there really isn't one. It's good to have one or two dominant colors, usually ones from your logo. One or two accent colors used sparingly that complement the dominant colors are also good to break things up a bit. Also make sure the site doesn't have tacky colors like neon or really bright colors that can make your site hard to look at. Does your site feel cluttered? It's understandable to want to fit a lot of information on your homepage, but if you don't space content out enough, it will turn off your users. You don't need to try to fit everything above the fold. (Check out our other blog post on for more on this: Newsflash: There is no fold.) Instead, make sure your more important information is at the top, and it will lead people to scroll down and read more. In the new design, we used a mimic of a computer monitor to showcase different features of the company. Which picture does your site look more like? Is there anything with your current site you're not happy with? Request a web design consultation, and we can help you take your site to the next level!